How about $1,237.50? That's what we made during our Live Trading Webinar yesterday in the S&P Futures alone. And that was at 2,925 – this morning, our two remaining Futures contracts stopped out at 2,915 after testing 2,912 and that was good for an additional $500 per contract gain – another $1,000 to start your day! Futures trading is not hard and it is not scary or complicated – that's one of the things we try to teach our Members in our weekly live trading Webinars. 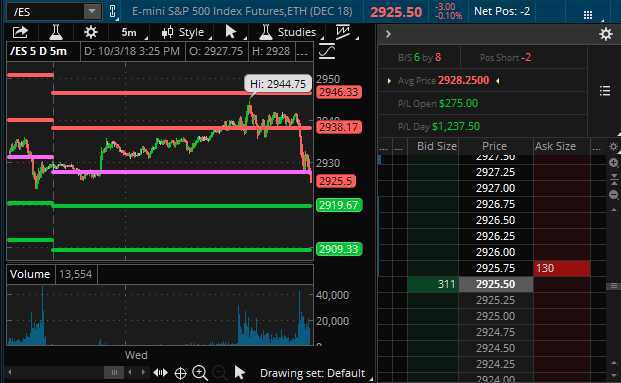 In fact, in yesterday morning's PSW Report, we made an entire case for shorting the S&P Futures (/ES) at 2,640 so all we did at the 1pm Webinar was follow our own advice. A 15-point drop on the /ES Futures is good for $750 for each contract and each contract requires $6,600 in margin and changes $50 for each point the S&P moves. So, the way we like to enter a trade in the Futures is to find a good line of support or resistance – in this case S&P 2,640 – and then we use that for a stop, say at 2,645, so we're limiting our loss to $250 but, ideally, we prefer to catch a move on the way under the line – so momentum is on our side and then we keep very tight stops over the line.